Here’s a quirky potholder for you: a potholder using the popcorn stitch, shaped like a tub of yummy popcorn! The textured popcorn stitches prevent pots and pans from slipping away from your grip. Notes: Ch 2 and ch 3 at beginning of rows counts as stitch. Color changes are made by carrying yarn from the very start of the work–doing this makes the potholder thicker and sturdier. Change to yellow. Continue work along the side of the square made with red and white yarn. With black, ch 8 and sl st in first ch to make a ring, make 20 sc into ring. Do not fasten off. Put the backs of the two pieces together, matching the top stitches on each side. Working through both thicknesses, attach the ring to the main body by working sc stitches around. 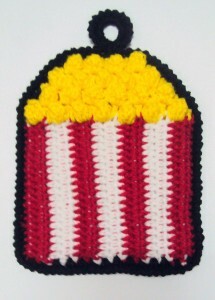 Enjoy your new popcorn potholder! If you need any help, just leave a comment below. This entry was posted on Thursday, December 23rd, 2010 at 1:22 PM by Claire Ortega-Reyes	and is filed under Free Crochet Patterns. You can follow any responses to this entry through the RSS 2.0 feed. You can leave a response, or trackback from your own site. LOVE, LOVE, LOVE, LOVE THIS!!!!!!!! This is the perfect quick project for my Cousin who eats popcorn almost every night! Thanks so much! I might even be able to get it done by Christmas! i love sitting on my comfy couch, munching on kettle corn popped in a stove top popper while enjoying a movie. this hot pat is going to be great addition to my kitchen and for gifts. thanks so much for sharing. a fun gift….popcorn hot pad, popcorn, a dvd ! I Think This Is Adorable, It’s So Cute !! Lookin Forward To Trying This One Out. Nice patterns It states that you are making ten rows alternating the red and white, in the picture I count 14 rows. Now when the popcorn stitch is started it states that you will end on the 14th row. Comfusing. Hello BeBe, Thanks so much for pointing it out! I just finished editing the instructions; it should all make sense now. This is so much fun! thank you so much for the hard work you put into designing and sharing it with us – it’s going to make some great gifts this Christmas! I can’t tell you how many sets of these potholders I have made. Awesome and fun!!! At row 14, do you ch 2? Hi Tiffany! Yes, it looks like it is missing a ch 2 at the beginning. Thanks for catching that!